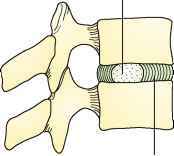 • Degeneration of the intervertebral disk can result in herniation, particularly at the L4-L5 and L5-S1 levels. • The presence of pain, radiculopathy, and other symptoms depends on the site and degree of herniation. • Initial screening for pathology and monitoring for complications (progressive neurologic defects, cauda equina syndrome, refractory pain) are essential in managing lumbar disk herniation. 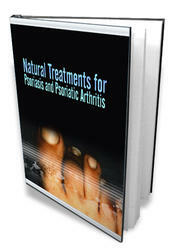 • Most patients with herniated disk recover in 4 weeks. The pattern of lumbar disk herniation is similar to that observed in the cervical spine. The most common levels for a herniated disk are L4-L5 and L5-S1. With aging and repetitive trauma, the disk undergoes significant changes in volume, shape, biochemical composition, and biomechanical properties. Lumbar disk herniations are believed to result from annular degeneration that leads to a weakening of the annulus fibrosus, leaving the disk susceptible to annular fis-suring and tearing and subsequently allowing degenerated disk contents to herniate and impinge on adjacent structures (Fig. 31-19). 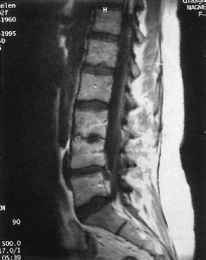 Herniation usually occurs at the weakest area, m. .
the posterolateral aspect of the disk (Fig. 31-20). Disk herniation is most common in the third and fourth decades of life. The onset of symptoms is usually gradual; the most common complaint is low back pain. When the disk herniates, it impinges on adjacent structures, causing sharp, burning, stabbing pain radiating down the posterior or lateral aspect of the leg, to below the knee, and finally to the foot. Pain is generally superficial and localized, often associated with numbness or tingling along the dermatome. In more advanced cases, motor deficit, diminished reflexes, or weakness may occur. An occasional massive central herniated disk compresses the cauda equina, resulting in bilateral symptoms, weakness, numbness, difficult urination, incontinence, or impotence, causing the cauda equine syndrome. Often the difficult aspect of evaluating patients with symptoms of a herniated disk is differentiation from low back strain. Pain caused by low back strain is exacerbated with standing or twisting motions, whereas pain caused by disk herniation, especially central, worsens with sitting or bending, Valsalva maneuver, coughing, or sneezing because of increased pressure on annular fibers. 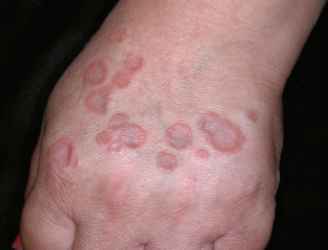 A complete physical and neurologic examination can reveal defects at specific levels. The physician first assesses for any external manifestations of pain by inspecting body position, gait, and ROM. The patient may be bending laterally or listing away from the affected side, or may stand with the affected hip and knee slightly flexed to relieve the pain or nerve compression. Local guarding and muscle tenderness on palpation of the area may be present. Sensory examination may reveal deficits along the specific nerve root distribution (Fig. 31-21). Motor weakness should be tested to localize the nerve root. Nerve tension tests (straight-leg raising, crossed straight-leg raising, Lasegue's test, bowstring sign) are often positive. The major finding on plain radiographs of patients with a herniated disk is decreased disk height. Radiographs have limited diagnostic value for herniated disk because degenerative changes are age related and equally present in asymptomatic and symptomatic persons. Therefore, patients with characteristic herniated disk or chronic disk degeneration usually do not require advanced imaging; it should be performed if suspicion is high for cauda equine syndrome, tumor, infection, progressive neurologic symptoms, trauma, or symptoms inconsistent with monoradiculopathy. CT and MRI should also be reserved for patients who fail conservative management and are being considered for surgery. With herniated disk, waiting 4 to 6 weeks is considered advantageous because herniations tend to reduce and most symptoms resolve. Both CT and MRI can identify disk herniations, but CT with myelography has increased sensitivity and specificity. CT also is less expensive and less sensitive to patient movement. However, MRI better visualizes the spinal chord (Fig. 31-22). Although low back pain and radiculopathy are common causes of disability, most patients experience resolution of their symptoms. Family physician is responsible to determine the goals and optimal management for each patient. The condition should be thoroughly explained to the patient, including the likely natural history and the potential forms of treatment. First-line treatment of a patient with lumbar disk syndrome or herniation is conservative, with limited bed rest, adequate pharmacologic treatment, and exercise. Patients are advised to remain active to speed recovery; excessive bed rest can result in deconditioning, bone mineral loss, and economic losses. Pain should be treated with NSAIDs or narcotics, muscle relaxants, and moist heat; most patients begin to improve with this regimen. The patient should resume early ambu-lation and begin gentle stretching exercises (see Fig. 31-16). Before starting a strengthening program for the back, flexibility must be restored with 3 to 6 weeks of daily back stretching. Strengthening exercises should be performed when the body is well-rested. First, the back muscles are stretched out for 5 to 10 minutes. Then sets of 15 to 20 of the following are performed daily for 6 weeks. As the strength of the back increases, the frequency can be reduced to three times a week. The knees are kept bent. The lower back is kept flush with the ground. The hands can be kept either behind the neck or held over the chest. The head and neck are raised 3 to 4" and held for 5 seconds. The abdominal muscles will gradually strengthen. In a standing position, a 5- to 15-pound weight is held in the hand. The back is tilted to the weighted side and is immediately brought back to center. The back should be tilted only a few inches! The farther away from the body the weight is held, the greater is the amount of muscle work! After a set of 15 to 20, the weight is shifted to the opposite side. These specific exercises are complementary to a regular aerobic exercise program. No single exercise is better than another. If you are having problems doing any specific exercise, discuss it with your health care provider. treatment or have persistent symptoms are referred to specialists. Indications for referral include cauda equina syndrome, progressive and profound neurologic deficit, and disabling pain refractory to 4 to 6 weeks of conservative treatment. Any surgical decisions should be firmly based on the clinical symptoms, which are confirmed with results of diagnostic testing. Percutaneous lumbar diskectomy, performed under local anesthesia, is a safe and effective noninvasive alternative to laminectomy. The percutaneous procedure is contraindi-cated in the presence of tumor, infection, foramina stenosis, loose disk fragments, spondylolisthesis, or severe facet joint arthritis. No long-term difference has been observed in the outcomes of patients treated conservatively versus surgically. Caudal or epidural steroid injection is controversial. Patients who continue to improve should begin preventive therapy, including overall muscle toning such as swimming or water aerobics; specific toning of the muscles of the back should become part of the patient's daily routine. Lifestyle changes should be incorporated to reduce predisposing factors. Conservative management is the initial approach in patients with low back pain with radicular symptoms, unless cauda equine syndrome is diagnosed (Snyder et al., 2004) (SOR: C). Procedures for spinal decompression may be considered in patients who have failed conservative therapy (Cochrane Review, 2005) (SOR: C). Figure 31-21 Root (segmental) distribution. Note that motion in each joint is controlled by four nerve roots running in sequence. Hip—flexion L2, L3, extension, L4, L5; knee—extension (and knee jerk) L3, L4, flexion L5, S1; ankle—dorsiflexion L4, L5, plantar flexion (and ankle jerk) S1, S2. (Inversion involves L4, and eversion L5, S1.) A useful mnemonic for the low limb dermatomes is that "we kneel on L3, stand on S1, and sit on S3." (Redrawn from McRae R Kinninman AWG. Orthopedics and Trauma. New York, Churchill Livingstone, 1997, p 26).